Bonn — As developing countries push the implementation of the 2015 Paris Agreement, scientists and leaders at the UN-led climate talks underway in Germany say the world will fail to meet the key goal of limiting global average temperature rise to well under two degrees Celsius above pre-industrial levels. 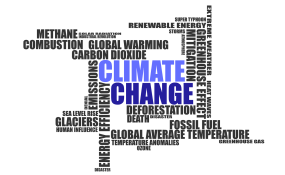 Petteri Taalas, Secretary-General of the World Meteorological Organisation, says that given the trajectory of carbon emissions, the world could well see a temperature rise of three degrees Celsius before the end of the century. Carbon dioxide emissions are on the rise again after a three-year period of stability, according to research published in three journals this week. The findings dash hopes that emissions might soon be reaching peak levels, and that the goal of the Paris Agreement - to keep global warming within 2 degrees Celsius - will be met. Data from the UK Met Office, NASA (US National Aeronautics and Space Administration) and the US National Oceanic and Atmospheric Administration indicate that the Earth has already warmed by 1.1 degrees Celsius above pre-industrial levels. China is the world's top polluter, followed by the US, the European Union, India and Russia. "This rise comes perilously close to the 1.5 degree Celsius limit of temperature increase, which the parties to the climate accord pledged they would pursue, while agreeing to hold the increase in temperature level to well below two degrees Celsius above pre-industrial levels," Taalas told SciDev.Net at the 23rd Conference of the Parties (COP23) to the UN Framework Convention on Climate Change (UNFCCC) which is hosted by Fiji but held in Bonn. Taalas says the trend foretells more intense and frequent extreme weather events, including climate change-caused paced sea-level rise, floods, hurricanes, cyclones, heat waves, droughts, extreme rainfall events, paced ice/glacial melt, and changes to agriculture that threaten food security - unless the world drastically cuts heat-trapping carbon emissions. The latest 'Emissions Gap Report' published by the UN Environment Programme (UNEP) highlights that nationally-determined contributions (NDCs) submitted by the 169 countries under the Paris pact cover only about one-third of the emissions cut required by 2030 to meet the climate targets set in Paris in 2015. "Even though the current NDCs are fully enforced, the carbon budget for limiting global warming to below two degrees Celsius (by mid-century) will be about 80 per cent depleted by 2030," said Carlos Alomia, a member of the Ecuador delegation, in an interview after attending the G77 and China UNFCCC plenary coordination meeting. Henry Neufeldt, a senior scientist at the Technical University of Denmark, told SciDev.Net at the launch of UNEP's report that the gap between emissions reductions needed and national pledges made in Paris stands at of 8-13 gigatonnes. This, he said, is alarmingly high: "If the emissions gap is left unplugged by 2030, the goal of keeping global warming to well below two degrees Celsius is unlikely to be achieved." Meanwhile, developing countries continue to criticise rich nations for dragging their feet on reducing emissions, providing finance for mitigation, and addressing loss and damage. "I have, as part of Like-Minded Developing Countries (LMDC), made concerns known during the plenary session and side events at the COP23 that rich countries are shifting their focus and responsibilities to developing countries for their post-2020 actions under the Paris accord," Said Majid Shafiepour, spokesperson for the LMDCs, told SciDev.Net. India's law minister and a key negotiator at the talks, Ravi Shankar Prasad, warned that inaction by rich nations on pre-2020 commitments would lead to a trust deficit between rich and poor countries over the post-2030 climate actions of developed countries under the Paris Agreement. The pre-2020 actions refer to existing obligations under the Kyoto Protocol, where only rich nations are obliged to take mitigation actions to cut emissions. Conversely, the post-2020 actions require all countries to take action under the Paris Agreement. In 2012, developed countries had agreed to undertake emission cuts that on aggregate amounted to at least 18 per cent below 1990 levels, but they are yet to ratify the decision. India's stance was supported by negotiators from other developing countries including China, Iran and Pakistan. Switzerland, though representing developed nations under the Environmental Integrity Group, also backed the LMDCs in pushing for greater pre-2020 actions.